As Facebook’s infrastructure has scaled, we’ve frequently run up against the limits of traditional networking technologies, which tend to be too closed, too monolithic, and too iterative for the scale at which we operate and the pace at which we move. Over the last few years we’ve been building our own network, breaking down traditional network components and rebuilding them into modular disaggregated systems that provide us with the flexibility, efficiency, and scale we need. We started by designing a new top-of-rack network switch (code-named “Wedge”) and a Linux-based operating system for that switch (code-named “FBOSS”). Next, we built a data center fabric, a modular network architecture that allows us to scale faster and easier. For both of these projects, we broke apart the hardware and software layers of the stack and opened up greater visibility, automation, and control in the operation of our network. We run our networks in a split control configuration. Each switching element contains a full local control plane on a microserver that communicates with a centralized controller. This configuration, often called hybrid SDN, provides us with a simple and flexible way to manage and operate the network, leading to great stability and high availability. The only common elements in the system are the sheet metal shell, the backplanes, and the power supplies, which make it very easy for us to change the shell to create a system of any radix with the same building blocks. Below you can see the high-level “6-pack” block diagram and the internal network data path topology we picked for the “6-pack” system. 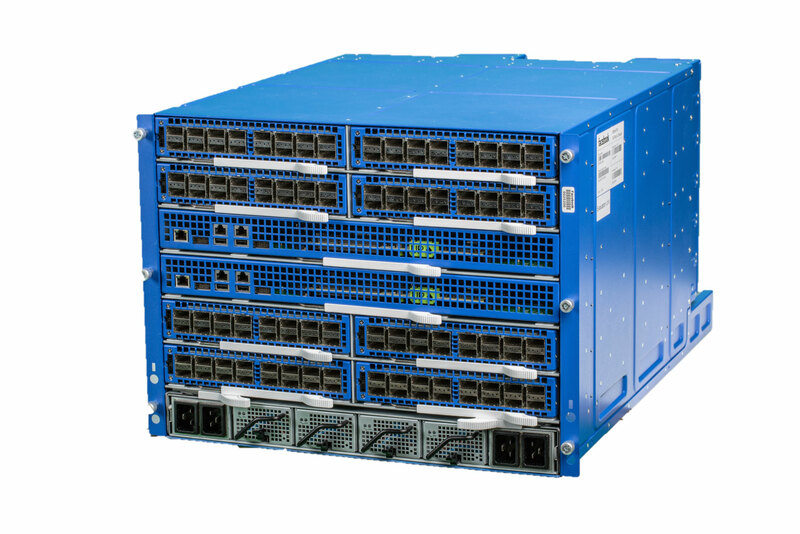 If you’re familiar with “Wedge,” you probably recognize the central switching element used on that platform as a standalone system utilizing only 640G of the switching capacity. On the “6-pack” line card we leveraged all the “Wedge” development efforts (hardware and software) and simply added the backside 640Gbps Ethernet-based interconnect. The line card has an integrated switching ASIC, a microserver, and a server support logic to make it completely independent and to make it possible for us to manage it like a server. The fabric card is a combination of two line cards facing the back of the system. It creates the full mesh locally on the fabric card, which in turn enables a very simple backplane design. For convenience, the fabric card also aggregates the out-of-band management network, exposing an external interface for all line cards and fabrics. “6-pack” is already in production testing, alongside “Wedge” and “FBOSS.” We plan to propose the “6-pack” design as a contribution to the Open Compute Project, and we will continue working with the OCP community to develop open network technologies that are more flexible, more scalable, and more efficient.